Think driving will get easier once the winter season ends? Think again. Warm spring weather melts away slippery snow and ice, but it also brings out one of the most problematic elements on the road: potholes. You might encounter dozens of potholes on your daily commute, and they can only be avoided for so long. You’re bound to hit one eventually, which can seriously damage your car. Potholes are road imperfections that occur when soil compacted beneath pavement becomes weakened or displaced. 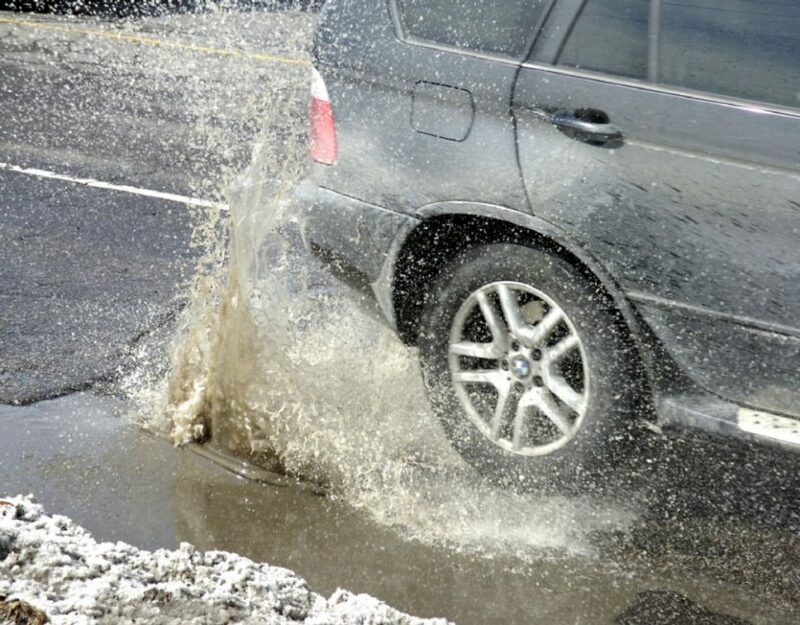 Roads are particularly likely to form potholes in winter and spring months, when ice and lots of running water disrupt the base layers under the pavement. As cars drive over these weak spots, the pavement deforms, cracks, and chips away, leaving a hole in the road surface. Potholes start small, but grow as traffic hits them, potentially becoming deep or large enough to damage a car. Potholes are notorious for wreaking havoc on cars: American drivers pay approximately $3 billion, or an average cost of $300 each, annually to fix car damage caused by potholes. Worse, many motorists encounter pothole problems every winter and spring, making pothole-related repairs an almost annual necessity. However, potholes aren’t only a problem in states that get cold, snowy winters. Even in sunny climates like California and Arizona, over 50% of roads are rated as being in poor condition and are often riddled with potholes. Feeling the jolt from hitting a pothole - and the uneasiness of facing an expensive repair - is something drivers everywhere have to deal with. Tires: Tires are meant to be the only part of your car that touches the road, so it isn’t a surprise that they’re susceptible to pothole damage like sidewall bulges, tread separation, or flats. These can happen because potholes often have a hard edge that compresses the tire against the wheel on impact, slicing the rubber or snapping the belts that hold a tire together. Driving on a blown out tire isn’t safe, but you may be able to repair it. However, a tire with a sidewall bubble or separated tread needs to be replaced right away. Cars with low-profile tires are particularly prone to pothole damage. Make sure your tires are always correctly inflated to help prevent these types of issues. Wheels: Scraping your rims never looks good, but even the worst curb rash can’t damage a wheel like a pothole can. Hard angles in potholes apply impact force to wheels in ways they weren’t designed to handle, leading to bends, chips, or cracks. A bent wheel won’t roll smoothly and may not be able to form an airtight seal with a tire. Chips are usually easy to notice since they look like a chunk missing from the rim where it meets the tire. However, cracks can be subtle hairline fractures along the wheel circumference or in one of the spokes. Brake dust and road grime can make cracks difficult to spot, so give your wheels a thorough clean and inspection to check. Bent wheels can sometimes be repaired, but chipped or cracked wheels can fail catastrophically and must be replaced entirely. Suspension: Car suspension is designed to absorb impacts and provide a smooth ride, but there’s a limit to how much it can handle. Sudden, jarring hits against potholes can cause a variety of suspension problems, including misalignment, broken ball joints, and damaged shocks or struts. Suspension bent out of alignment can usually be put back into place by a qualified mechanic, but until it’s fixed you may notice your steering wheel is off center, your car pulls in one direction, the handling feels loose, and your tires wear unevenly. Unusual vibrations and sounds, wandering steering, poor ride quality, or the vehicle leaning to one side can indicate broken ball joints, struts, or shocks, which usually need to be replaced outright. It can be difficult to correctly diagnose suspension damage, so it’s best to have an experienced mechanic inspect the entire system if you notice any of these symptoms. Exhaust: Since exhaust pipes run along the undercarriage of a car, they’re a perfect target for potholes lurking in the road. Deep potholes can cause a car to bottom out and scrape the undercarriage against the pavement, potentially denting or ripping a hole in the exhaust pipes, muffler, or catalytic converter. You may experience a loss of power or unpleasant noises if there’s a hole in your exhaust system, but perhaps worse is the fact that your car will spew out harmful pollution unchecked. What’s more, a leaky pipe can let exhaust fumes into the cabin, posing a potentially serious health hazard. Body: Generally speaking, the lower a car is to the ground, the better it handles, but cars that sacrifice ride height in pursuit of sportiness are more likely to be damaged by potholes. In addition to the issues listed above, potholes can scrape against low-hanging bumpers or side skirts. While this type of damage is usually cosmetic and doesn’t affect safety or performance, it’s still something that drivers who care about their car’s looks want to avoid. If you drive a low, sporty car, use its sharp handling to safely maneuver around any potholes you see. If you have any concerns following an encounter with a pothole, call the Flynn Service Team at 413.443.4702. Article courtesy of YourMechanic.com. Read original article here.